If you want to know what curcumin is and how it can benefit your joint health, then you want to read this article. Joint pain often occurs when the cartilage in your joints becomes inflamed. Taking curcumin reduces inflammation in your joints, which reduces joint pain and improves joint health. Curcumin must be combined with black pepper extract to exert its beneficial effects. Curcumin is getting more and more buzz these days. Some say curcumin is a natural way to fight inflammation, soothe nagging joint pain, and even improve your mood. Others say it’s just another quack herbal remedy with no value whatsoever. And still others say that even if it does have benefits, there’s no point in buying supplements since you can get all you need from food. So, who are you supposed to believe? Curcumin is one of the most popular supplements recently yet also the most confusing; it is recommended for anything from joint pain to mental health yet, well, it’s recommended for everything from joint pain to mental health. How can something be so versatile and, if so, could it really be effective? Even if it was effective, it’s pretty much just curry extract; why not simply eat more turmeric and curry products to get its benefits? Why do people recommend the supplement and not the food? Truth be told curcumin is incredibly complex, which in part leads to the confusion surrounding it since it’s so complex no single article can cover every single benefit and downside of it without exceeding 20,000 words. And quite frankly, it’s doubtful most people would read that much. So we’re covering some of the more important aspects of curcumin today. Why Do People Supplement with Curcumin? What Types of Results Should I Expect with Curcumin? Does Curcumin Have Any Side Effects? What’s the Best Type of Curcumin? Curcumin is the main molecule found in turmeric, the main spice in curry-flavored foods. Named after the official name of the plant, curcuma longa, curcumin is one of a few compounds collectively known as “curcuminoids” and by far the most common one in both turmeric and, surprisingly, ginger as well. While it isn’t the only compound in these spices, it has been researched a lot for the past few decades since it seems to affect the body even when you ingest the spices. Then they were put into dietary supplements and a whole new world was opened. For this article, we will be discussing curcumin supplements rather than the food itself. Take-away points: Curcumin is a molecule that is pretty unique, found only in turmeric (the curry spice) and to a lesser amount in ginger. It is yellow, a bit smelly, and associated with deliciousness. Now, the obvious question; why do we even care about all that? Well, the main reason most people supplement with curcumin is to reduce joint pain caused by inflammation. That’s not how the research on this molecule began, though. It all started in the past with a very simple desire, “Everybody is eating this and we know nothing about this and that is a bit concerning.” When there is a molecule found in a very common and popular food scientists do need to check to see if it helps, harms or, if neither then we need to at least get enough evidence to prove that it doesn’t do much. Sometimes with such research you get practical advice even medical doctors appreciate (ex. consume fatty fish at least once a week when pregnant) and at other times practical tips for things to avoid (ex. do not over consume fish high in mercury). If the food has benefits that can be traced back to a single molecule then, more often than not, people are totally gonna throw it into a pill and sell it. Usually encapsulating compounds in food falls flat on its face as the isolated compound doesn’t do much or the “thing” that it does is simply outclassed by other stuff already on the market. For example, if something helped increase blood flow (while doing nothing else) and making a supplement out of it would cost you $20 a bottle, but it improves blood flow to a lesser degree than grape seed extract which is astonishingly cheap, then why bother? Most plants and plant-based compounds fall into this category where their actions are neither unique, potent, nor cheap enough for them to be interesting to either the scientist or consumer. However, curcumin seems to have unique effects. Incredibly unique, and one could argue (or at least, I would argue) that a major reason that it has become so popular is because scientists kept on finding out new things that it did. The large amount of research on it made it seem like a cure-all. And a cure-all it was indeed marketed, with many studies taken out of context and claiming to “cure” things they merely interact with; like saying a hat cures concussions simply because it can interact with your head. Rather than looking at every aspect of curcumin in this article we’re going to cover a few major aspects of supplementation, the ones that are talked about most, and see where this supplement stands on them. ‘Cause I’ll be damned if I’m going to cover everything on curcumin even in an article series. Thing has well over ten thousand different studies related to it based on its name alone. Take-away points: Curcumin was initially researched because it was something people ate and scientists needed to confirm it to be safe. It ended up being pretty interesting, and while scientists chugged away unravelling its mysteries it was encapsulated and marketed (falsely, again) as a panacea. It’s a good molecule, it’s just not as amazing as some people claim. So, since we know that most “benefits” associated with curcumin are nothing more than interesting mind-candy for the educated we can ask ourselves; what benefits of curcumin should we actually care about? There are three major ones to be covered in this article, and a little special addition for the fun of it, that all ultimately tie into one underlying mechanism. Inflammation is the term that refers to the actions of the immune system. The immune system can be seen as the police force of the body, being able to go anywhere and either support or suppress bodily actions depending on what they are directed to do. The process of strengthening, bolstering, repairing, growing, and defending is what we refer to as inflammation. Great in small amounts, but when you try to force this stuff to happen when it is not needed, the body, at a microscopic level, basically starts to self-harm. Anti-inflammation is, conversely, quite passive. Rather than trying to shut down your cellular borders due to the imminent threat of biological immigration it simply lets things happen. When used medically it’s called immunosuppression, usually used when it comes to organ transplants and want your body to not reject it. When it comes to the average person, however, it’s a balance. Too much inflammation is self-harm whereas too little inflammation lets infectious parasites have free reign over your body. Despite being a balancing game, however, it seems on average many of us are at a higher level of inflammation than we would normally like. In accordance with this, anti-inflammatories have a bit more importance right now in society. It inhibits cyclooxygenase (COX) enzymes similar to NSAIDs. It has preference for one of the COX enzymes, known as COX2, over the other one known as COX1. Inhibiting both at the same time is more potent but leads to some intestinal side effects like ulceration (seen with NSAIDs) but curcumin inhibits COX2 specifically. While only inhibiting COX2 would make it safe but weak, it also inhibits the lipoxygenase (LOX) enzyme increasing potency and also making it a bit more safe. It suppresses these enzymes, which turn anti-inflammatory molecules into inflammatory ones, secondary to acting on the cell’s genome or storage of genetic data. It’s more of an indirect inhibition when compared to aspirin or ibuprofen which directly block those enzymes from acting like a bouncer. If curcumin is a potent and safe anti-inflammatory, when am I inflamed and when should I take it? Well, that’s what the rest of this article is about. Take-away points: Curcumin does a lot of things via influencing the nucleus of a cell and the DNA within it but, for the most part, the fact that it helps to regulate COX and LOX enzymes helps it to mitigate inflammation. We use the term “joint health” to refer to issues pertaining mostly to the knees, hips, and back that arise due to either exercise or age-related degenerative diseases. In practice this means that those with poor joint health tend to experience creaky knees, pain when moving (particularly when immobile for a period of time), reduced range of motion for their joints, and overall reduced quality of life since every movement is accompanied by some degree of either pain or inconvenience. Curcumin has been investigated for its role in joint health due to how, ultimately, it has similar mechanisms to NSAIDs that are known to help. Any potent anti-inflammatory can be of help here, so does curcumin help those with joint discomfort? Common measurements of joint mobility, joint pain, and quality of life all seem to be improved compared to placebo when curcumin is taken at around 1,000mg a day. Sometimes the best course of action in talking about how something benefits you is to simply drop a ton of evidence on your lap first and then go from there. So in regards to the question and in no particular order, here you go! A non-comprehensive list of human trials on osteoarthritis. Of course for the researchers among you a good read might be this review and meta-analysis by Daily JW et al; free to access. Ultimately, these studies simply show that some form of enhanced curcumin absorption works. Most studies use Meriva (a phosphatidylcholine-curcumin complex) and, honestly, we would have used it in Fortify if it wouldn’t have increased the price per bottle for the consumers. When curcumin has been compared to other drugs (known as “references,” because what good is knowing that curcumin works if you don’t know if it works better than what you’re already taking?) then we have curcumin working better than diclofenac sodium (here) and to a similar degree and safety as Ibuprofen (here of here). Ultimately, it just works. It doesn’t work better than over the counter drugs like Ibuprofen and we could still use some higher quality trials for some nail-in-the-coffin action but, hey, it works and there is reason to believe it does so with less side-effects than Ibuprofen which is already a real nice drug. Take-away points: When it comes to improving joint health and well being in osteoarthritis and, to a lesser demonstrated degree, rheumatism, curcumin just simply works. Not better than Ibuprofen and other over-the-counter options (yet to be compared to Aleve) but it’s nice to have a dietary supplement with evidence to suggest comparable potency to drugs. Depression is a difficult concept to cover since it refers to an abnormality in brain chemistry that causes depressive thoughts to be more common among many other side-effects. It isn’t simply feeling sad for a day or two (that’s usually just referred to as “general well being” or “quality of life” in scientific studies) but rather when your brain tries to keep you in a self-degenerative pattern of thought and actions. The majority of the time lifestyle modification such as exercise and diet are recommended and, if symptoms don’t get worse, you go straight to the M.D to get yourself checked out but many people seek out supplements as a middle ground between these two options. Now, some supplements do indeed help with depression both mild and major. It isn’t unheard of for supplements to help with depressive thoughts but why would curcumin be one of them? Simply put, depression and inflammation are indeed linked to a degree. Curcumin is also touted as being an antidepressive supplement as there are known links between inflammation and various neurodegenerative diseases but, if curcumin can be seen as herbal Ibuprofen, does it confer anything unique that Ibuprofen doesn’t cause ain’t nobody think of Advil as a brain health supplement. Evidence suggesting benefits to major depression with curcumin have been noted three separate times, nonsignificant benefits in three other studies (nonsignificant meaning that benefits seemed to occur but not to the accepted level which scientists would put their faith in) and one failure. Looking at the studies collectively there does seem to be a positive trend but all studies use different measurements of what it means to “help depression”; this is definitely a field that needs future studies to hammer it out. It does seem to show some preference towards more significant forms of depression (with more efficacy the more drastic your depression is) but that is creeping dangerously close to the realm of pharmaceuticals which are clearly better options for major depressive disorder while curcumin seems to have less efficacy for the depression that you’d actually want to use supplements for; minor depression. So is it an antidepressant? Looks like it could be. Is it a practical option? Nah, it’s in a weird place. Take-away points: Curcumin does seem to have antidepressant actions but the studies aren’t unified right now, many using different measurements, and some null data to boot. It doesn’t seem to fit into any real practical niche that would make it a good option. Metabolic syndrome is a term used to refer to the state that one may reach with an unhealthy lifestyle that, more often than not, is the combination of obesity with prediabetes and elevated cardiovascular risk factors. Metabolic syndrome could be described, at least in part, by the body getting accustomed to inflammation and oxidation and rather than normally regulating these processes it instead perpetuates them leaving the body like a sad clown; self-degrading with an inevitable fall. Most measurable parameters get worse and things that can help inflammation and oxidation have a good chance at improving a handful of these parameters which, in turn, suggest the body is in a healthier state and more able to fix itself when diet and exercise are introduced. Those with metabolic syndrome may not technically have any disease states (they potentially could) but generally the stability of their health is a house of cards in a hurricane. Diet and exercise are obviously the go-to options here but many compounds have been researched to help ease the process of losing weight and eating healthier or simply speeding it along before the disease states catch up. Due to combination anti-inflammatory and antioxidant effects, as well as just generally being on people’s radars, curcumin has also been investigated for this role with pretty good results. Curcumin reduces inflammatory measurements in the blood, increasing anti-inflammatory ones, while increasing those of antioxidant measurements. Again the links provided are not a comprehensive list of everything done on curcumin but a relatively recent meta-analysis specifically looking at inflammation and oxidation has concluded reliable benefits with curcumin/piperine (black pepper extract) combination. There are, of course, some more practical benefits to those with metabolic syndrome such as improvements in lipids and blood glucose levels occurring alongside weight loss. It has also been noted that cholesterol itself can be modified to a less harmful form. Now, the benefits seen with curcumin here are not necessarily amazing potent (while it isn’t common for supplements to benefit metabolic syndrome there are indeed a handful that may) and the underlying mechanism that unifies these all is pretty basic. Take-away points: Curcumin seems to help numerous parameters of metabolic syndrome and is thought to work well when combined with other therapies for this condition. While it is uncommon for a dietary supplement to have these effects it isn’t necessarily “rare” or “unique” of curcumin. This isn’t so much a proven facet of curcumin insofar as a pretty interesting thing that I recently discovered getting evidence for all the other things. Curcumin has at least twice been shown to reduce symptoms of PMS associated with increased brain protective factors. Just kinda wanted to note that since, for the longest time, vitex agnus castus has been the only real option for alleviating symptoms of PMS. Neato. For your joints, if you have joint pain associated with arthritis then you can expect clear benefits from curcumin after supplementation over a period of 4 to 8 weeks. Benefits may indeed come faster, and these benefits may also apply to other instances where joints are inflamed including athletes, but don’t get your hopes up for those ones. Faith in this is reserved for arthritis. For mental health maybe it will help with severe depression, maybe even a side of anxiety reduction, but we cannot really put our faith and backbone behind promising that. It is still very much a “what works for you” scenario and there may be unknown interpersonal differences. At this moment in time curcumin does not appear to have any major side-effects. Every now and then a study finds that a few subjects report gastrointestinal distress but the amount of these side-effects is pretty low and, honestly, most supplements report those side-effects. Ultimately, the worst type of curcumin is simply consuming turmeric. It isn’t unhealthy by any means whatsoever but curcumin needs to have something taken alongside itself, or otherwise be modified in its enhancement in some manner, for it to have potent effects. Although if you want curcumin to benefit your intestines then bad absorption is actually a plus; it fails to get absorbed from your intestines and stays…in your intestines. If you hear anything about curcumin benefiting the gut then no need for supplements just eat curry! The most well studied form of curcumin is Meriva, a patented formulation of curcumin and phosphatidylcholine, a chemical found in various foods that helps curcumin get to the tissues it is targeting. Curcumin can also be taken with piperine (black pepper extract), which increases absorption by up to 2,000% by inhibiting a metabolic process that gets in the way of your body’s ability to process the molecule. Percentages can get pretty big when the first number was small eh? And those are the two forms we can recommend in good faith; the one used in more scientific studies but at a much higher financial cost (Meriva) or the cheaper one that also works decently (piperine combination). You could also put black pepper in your curry to get that delicious curcumin/piperine combination but since there are no real studies on that don’t expect it to carry the benefits talked about in this article; more of a “just a healthy combination” peace of mind. If you’re all fired up to buy a curcumin supplement, then just make sure you buy one that also contains black pepper extract. 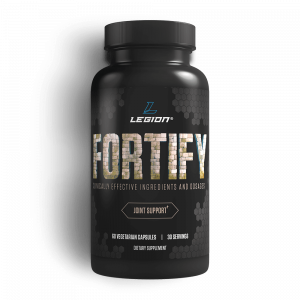 This is why Legion’s joint supplement FORTIFY contains a combination of 500 milligrams of curcumin and 20 milligrams of black pepper extract. Ultimately, curcumin is indeed something that does work. It may be marketed as a cure-all but that is probably just because researchers tried to figure out how it interacted with every disease state under the sun. both positive and null results lead to the idea that because it was researched for everything it must work for everything. Curcumin works, to a small degree, for many things that typical anti-inflammatories and antioxidants do but holds specific potency when it comes to joint health. Far from being just a simple NSAID though, it seems to hold more benefits for depression and even general health. If you had to choose a supplement, curcumin would most likely be a top 10 candidate overall. Not that bad when there are probably well over 500 herbs, molecules, and foods out there calling themselves supplements. What’s your take on curcumin supplements? Have anything else to share? Let me know in the comments below!